The Ditchling Players can trace their roots back to between the Wars when there was a very active drama group in Ditchling. There is a woodcut design by Eric Gill for the Ditchling Dramatic Club dated 1923, which was inspired by Amy Sawyer, who lived in the village. As well as being a renowned artist she wrote whimsical plays about Sussex village types. These were published in 1934 in a book Sussex Village Plays dedicated to the Ditchling Village Players. The Players performed all over Sussex and there is a record in the Sussex County Herald of April 1925 of their being involved in a charity concert in the Winter Garden at Eastbourne. 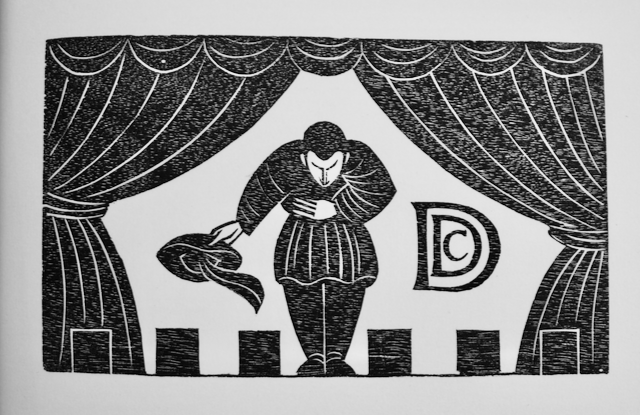 Woodcut image by Eric Gill for the Ditchling Drama Club. Courtesy of Ditchling Museum. The Second World War put an end to this, but on the 9th January 1945 a meeting was held at the Old Meeting House to revive the group. It was felt that the name Village Players was too restricting and so the Ditchling Players was born. One of the original committee members is now one of our patrons, Leon Sinden, and his sister, Joy, both acted and produced for the Players right up to her death in 1993. The Players went from strength to strength and in 1956 were the proud winners of the Sussex competitive drama festival. The Players also had considerable input into the Ditchling Pageant, which was held every ten years up until 1981. Grace Denman provided the artistic inspiration for both the colour co-ordination and costume designs for this event as she did in many of our productions including ‘Alice Through the Looking Glass’. This 1969 production was adapted by our late President Pamela Grieve with music written by John Ferdinando and Peter Howells. It was also a success for Martha Kearney, now the BBC’s Political Correspondent, who played Alice. This production was recently featured in a BBC Radio 3 documentary. In 1972 the Ditchling Village Hall, where our productions are staged, was rebuilt and the Players were able to co-operate with the architect to ensure that we have one of the best amateur stages in the district. In 1999 the Players brought pantomime back to Ditchling for the first time in a number of years and since then we have continued to diversify our productions with not only ‘straight’ plays – musicals and pantomimes – but also Murder Mystery Evenings and other social events for the members. We are also pleased to have become involved in raising money for local charities by holding events at St George’s Retirement Village and Danny House, Hurstpierpoint. Like all amateur dramatic groups in the area the Ditchling Players pride themselves in a high standard in all their productions and this has been rewarded over the years with a number of Mid Sussex Times Awards for not only their acting abilities but backstage skills too.